Do you want to tell your sweetheart how much you love them? Give them something luxurious and memorable, like a lush bouquet from top-notch Sharjah florists. You don’t have to settle for anything mediocre. Sharjah has many professional florists selling beautiful arrangements to make your loved one happy. Below are our top picks of best flower delivery in Sharjah. Happy shopping! The best florist in Dubai also delivers affordable, modern bouquets to Sharjah. A Better Florist is a highly recommended florist in the UAE for a lot of reasons. Chief among those reasons is their fast and free same day flower delivery in Sharjah and the UAE. Critics and customers alike rave about their swift shipping of professionally handcrafted arrangements. Price-wise they’re also easy on the pockets. In fact, they now have loyal customers because of their luxurious arrangements with affordable price tags. Black Tulip Flowers delivers to major areas in the UAE, Sharjah included. This UAE florist provides both same day and next day flower delivery in Sharjah not just for fresh flower arrangements but also for gifts. This is why they have flower combos, combining bouquets with gifts depending on the occasion. So for birthdays they have food and flower combos, while for romantic occasions you can find chocolates or wine bundled with a bouquet. The Flower Market has one hand bouquet available daily, basically the florist’s choice. This saves time for people who just want to surprise someone with a nice, beautifully crafted bouquet. You get a freshly-picked look for a bouquet and flower delivery in Sharjah. Bunches and bouquets are packaged in simple paper wrapping, fully reusable or recyclable. Sharjah Flower Delivery can deliver within 3-4 Hours of receiving your online order. Same day flower delivery in Sharjah is available on all days, except during Valentine’s Day because of the anticipated high volume of orders. Due to this peak season, they have a lot of options for rose bouquets and romantic flowers. Damas Flowers is an all-around service for parties and events. They provide arrangements for weddings and birthdays. You can buy flowers and balloons for venue decoration, but you can also buy bouquets per piece. Most of their floral designs are soft and feminine, pretty pastels to suit different occasions. Plus, as long as you buy products upwards of AED 100, you get free same day flower delivery in Sharjah. Bliss Flowers excels in combining crafting arrangements infused with architectural elements. With clean lines and interesting textures. Fortunately, you won’t have to shell out a lot of cash to enjoy their products. Bliss prices range from budget-friendly options to luxury bouquets. Although, their bestsellers are definitely the romantic floral designs. For a modern twist, you can try their “Surprise, Surprise” bouquet which uses a glossy paper bag as packaging for their premium blooms. Flowers in clear, acrylic boxes from Maison de Fleurs give off that chic, polished packaging to impress your spouse or significant other. Other Euro-chic flower arrangements such as floral hatboxes are also available for purchase. Maison de Fleurs provides free flower delivery for Dubai – Jumeirah customers with a minimum purchase of AED 350. 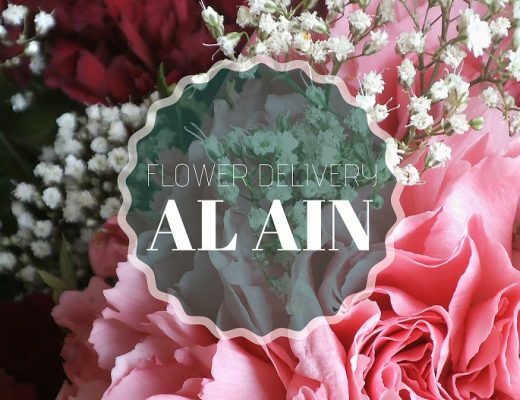 Meanwhile, flower delivery in Sharjah starts at AED 50 with a minimum purchase of AED 350. Alissar Flowers delivers fresh blooms 7 days a week, 365 days a year. They also accept same-day deliveries until 1pm. They specialise in Western floral arrangements and Euro-chic flower boxes. If you want to add an extra special message rather than the usual card, they provide video bouquets which allow customers to send a video along with the bouquet. Recipients simply scan a QR code (or Quick Response Code) using their smartphone to view the video created by the sender. If you want to infuse your own creativity with your surprise bouquet, try out the DIY bouquet from The Flowerful Project. This is basically a floral subscription service which you can try once just to see if it’s for you. What you get are fresh cut flowers placed inside a secure box along with instructions on how to arrange the flowers in your vase. For something simpler, they have single-variety bouquets with premium blooms.